No. 23, Jalan Permatang 12, Taman Desa Jaya, 81100 Johor Bahru, Johor, Malaysia. 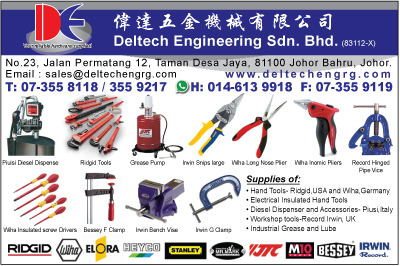 Deltech Engineering Sdn Bhd, your reliable hardware supplier since 1982. Deltech carry a wide range of industrial supplies which consist of refractories & heat insulations, food grade pipings and fittings, branded hand tools, industrial coatings and hoses etc. 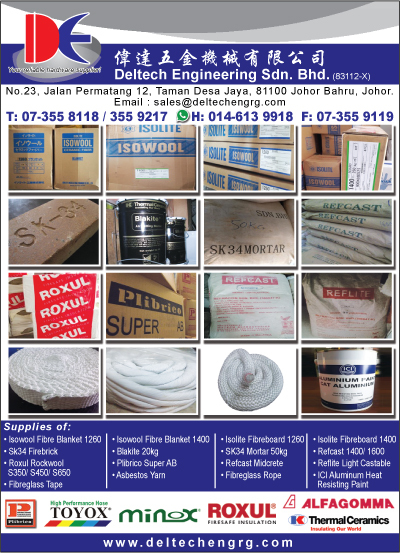 We keep full range of refractories in JB store for our local customers convenience. Products are castables, fire clay bricks, fibreglass tape, rockwool slabs, ceramic fibre board and mouldable refractories etc. We also have high quality certified food grade fittings and stainless steel hoses. As for hand tools, we have Ridgid,USA products, Wiha, Stanley and Heyco etc. Deltech have a long great track record in supplying goods to engineering workshops, industries of oil & gas, palm oil mills and metal mills.